Our Web Creation Is Here For You! You're fired! We can't keep up with demand for puppies, the website is too good! With the new site, business is increasing so much I need more help. I keep getting compliments about our new website from veterinarians and exhibitors, GREAT JOB! Many clients had started their venture into the web either by creating their own site or using a template-driven site. When I discuss what’s possible and the costs involved, they realize that having a consistent, engaging, elegant site is possible. Our process in creating your website is all about collaboration, working together to create a website that represents your personality and the mission of your organization or business. To go into detail is difficult, since it's a mixture of technology, artistic ability, collaborative thinking and experience with translating your ideas into a visual website. So, just take a look at a couple of our sites below by clicking on their homepage image, or check out our Portfolio! 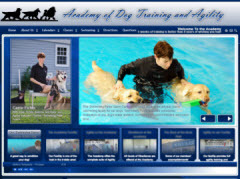 This site is for a dog training facility with canine hydrotherapy. 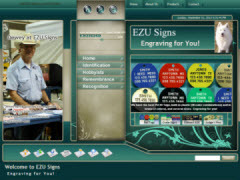 This site is for an engraving company, showing PayPal integration and a more appealing approach to a catalog. 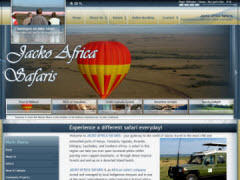 This site is for a tourism company, bringing tourists to Africa for safaris and life experiences.